Both adults and children enthusiastically report how easy, safe, convenient, and enjoyable it is to ride the FrontSeat™. 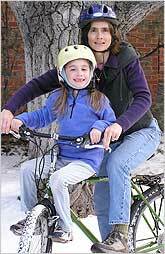 No other bicycle child carrier offers off road capabilities like the FrontSeat™. If you want a workout, try taking an 8 year-old mountain biking on the FrontSeat™! A demand exists for a front mounted carrier with the capabilities of the FrontSeat™. Children and adults turn their heads when they see the FrontSeat™ in use. Parents are in search of quick, fun activities where they can have interaction with their children. The occasional biking adult has become a proven customer for the FrontSeat™. Once an adult and child have tried a ride, they buy a FrontSeat™. When they buy one, they buy two, one for each parent. We are continuously asked when the FrontSeat™ will become available. FrontSeat™, Raising the Next Generation of Mountain Bikers!